Dragon Naturally Speaking Premium and Professional Individual speech recognition voice activated software training in the UK. We offer two options – either live online training in all versions of Dragon NaturallySpeaking speech recognition software, Premium and Professional. Or face to face training at our picturesque location here in North Wales. Contact us for further information. If you take the online training option, your training session(s) is recorded for your future reference. This is a real benefit compared to traditional training! Live online training – how does it work? 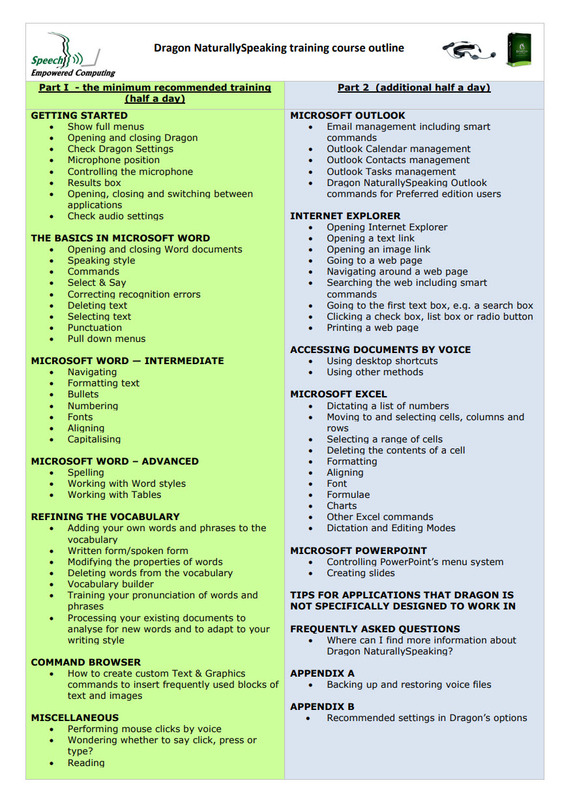 We recommend the ‘Part I’ course in the left hand column of the table below (shaded green) as a minimum to be serious with Dragon. This takes up to 4 hours. If you are taking the live online training, we would recommend you opt initially for 2 hours training and to decide if you would like the additional 2 hours later. Doing this will ‘get you going’ nicely with Dragon as you will uncover a new way of working. If you come to us for face to face training, we would recommend the Part I 4 hours which is a half day’s training. If you’d like to be able to voice activate any of the packages in Part II (the right hand column shaded in blue), then some additional training time is required. Taking all of Part II requires an additional 4 hours. But if you only need certain elements in Part II, you may just need 1, 2 or 3 hours. We can discuss your needs and advise what best suits your specific requirements. What is the cost of the training? The online training is £60 per hour. No VAT is added. The face to face training is £290 (no VAT is added) for Part I which includes all training materials, refreshments and lunch. If you also want the Part II training or certain elements within Part II, we can estimate the cost for you after discussing your requirements with you. We are also able to teach you to use Don Johnston CoWriter word prediction software. Training either online or face to face at our location to suit. Contact us for further information.